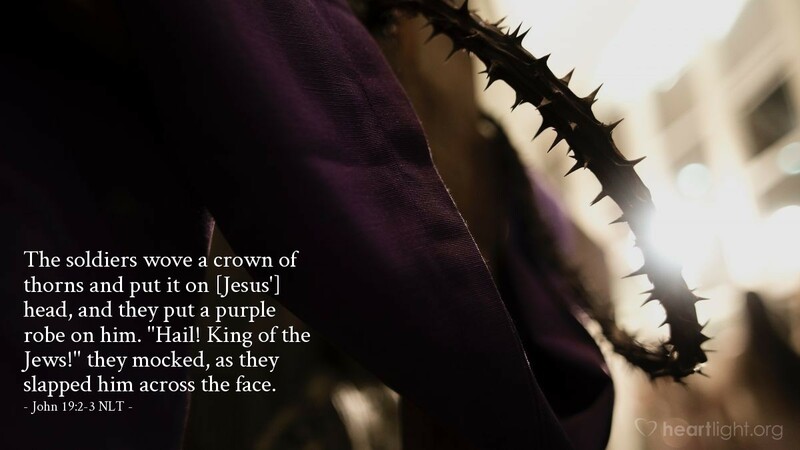 The soldiers wove a crown of thorns and put it on [Jesus'] head, and they put a purple robe on him. "Hail! King of the Jews!" they mocked, as they slapped him across the face. If you can't beat him, mock him. That might have been the slogan of the religious leaders who hated Jesus. A long night of mockery and torture was well underway. The people Jesus came to save were repeatedly, one group after another, rejecting him and sending him to his death on a cross. These acts were not some sort of token pain. Beatings, long sharp thorns, and being hit with fists were only part of the journey of pain Jesus faced. The saddest part about this to me isn't just Jesus' pain — although that is horrific enough; it's that Jesus is the rightful King and they rejected him unmercifully. I wonder how many times God has presented me with a blessing, an opportunity, which I've not only missed but also criticized and ridiculed. Jesus' mistreatment by those who were the most religious should humble those of us who consider ourselves to be spiritually committed today. Father, open my eyes and my heart so that I never reject your opportunities and blessings. I don't want my heart to be hard to your gracious work in the world and neither do I want to be harsh with those with whom I disagree or whom I don't understand. Give me the wisdom to pursue your will and to turn away from pettiness and evil. In Jesus' name, I pray. Amen. What Jesus Did is a one-year devotional guide through the gospels, using one short passage each day and following the Gospel in consecutive order. Each devotional consists of a passage, reflection and a prayer which opens up the day's scripture and shows how it challenges you to live for Jesus. What Jesus Did! is written by Phil Ware. Scripture quotations are taken from the Holy Bible, New Living Translation, copyright ©1996, 2004, 2007, 2013, 2015 by Tyndale House Foundation. Used by permission of Tyndale House Publishers, Inc., Carol Stream, Illinois 60188. All rights reserved. Get What Jesus Did! by EmailJoin 1/4 Million Daily Readers!